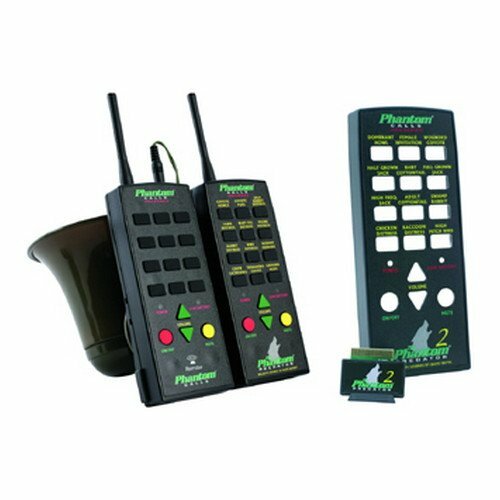 Phantom Predator/Predator 2 combo pack features: - all sounds are 100 percent natural- interchangeable sound modules- up to 126 db of volume- 16-bit sound processor- up to 200 yard range- operates on 8 AA batteries (included)- up to 16 hours battery life-full volume- auto shut off after one minute idle- power and low battery LEDs- raised rubber keypad- detachable belt clips- -40 degree operation- mute button - sounds: dominant howl, female invitation, wounded Coyote, half ground jack, baby Cottontail, full grown jack, high frequency jack, Adult Cottontail, swamp rabbit, Chicken distress, raccoon distress, high pitch bird, Coyote howls, Coyote pups, jack rabbit distress, fawn distress, baby pig distress, feline distress, rabbit distress, bird distress, rodent squeaks, crow gathering, thrashing leaves and ground hop. If you have any questions about this product by Extreme Dimension Wildlife, contact us by completing and submitting the form below. If you are looking for a specif part number, please include it with your message.